In the village of Jumrung in Rayong province, the children are following the same principles of backyard vegetable gardening that has been practice for generations. Whenever the children want to eat any of the fruits, vegetables, leaves or flowers that are grown surrounding their homes, they can pick them whenever they want. Some of the edible plants grown on their own and some are grown intentionally. Furthermore, the children know the uses parts of the different plants that are grown. Rice is the staple of the Thai diet and the fruits and vegetables in the backyard garden provide the necessary vitamins and minerals for strong and healthy bodies. This ensures that the people of the household have good food to eat, even in the leanest of times. Not only does the edible plants cultivated by the families provide for the basis of a good diet, any surplus can be sold for extra income for the household. Is urban farming sustainable in Bangkok? I’ve been growing my vegetable garden for six-months now and I’ve got Asian greens and cucumbers to show for it. Now that it’s the rainy season, the plants are really taking off. 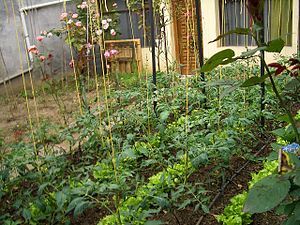 But, having seen urban farming being practiced in the US, I really am wondering if the urban farming movement can take root in Bangkok? Traditionally, Thais have been a culture which maintained kitchen gardens and often raised small animals like ducks and chickens. However, things have changed as large numbers of Thais now live in Bangkok and its suburbs. With more people living in crowded dwellings like condos and apartments without any land for gardening, many of the traditional ways have been forgotten. I’m sure the retired grandmothers and grandfathers who live in the city have the knowledge and time to grow a vegetable garden, but what about the younger generation? Moreover, the rapid lifestyle of the average worker means that few have time to spend gardening, even if they have the time to do so. Many young Bangkokians spend their days pushing computer keyboards and nights working late before heading grabbing a bit to eat at the nearest food court or street vendor. They rarely have time for a home cooked meal, let alone grow their own vegetables. While I am keen on urban farming in general and think that now is the time for people everywhere to embrace the concept. I truly wonder if the average Bangkokian teenager, twenty- or thirty-something would want to be part of the urban farming movement. Most Bangkokians are a bit on the lazy side, try to keep out of the sun and are not looking to get their hands dirty. Bangkokians are notorious for rushing to the malls and movie theaters on weekends to enjoy the shopping and air conditioning. Doesn’t exactly sound like the types who would have fun pulling weeds and turning compost. So, again I ponder the question : Is urban farming sustainable in Bangkok?